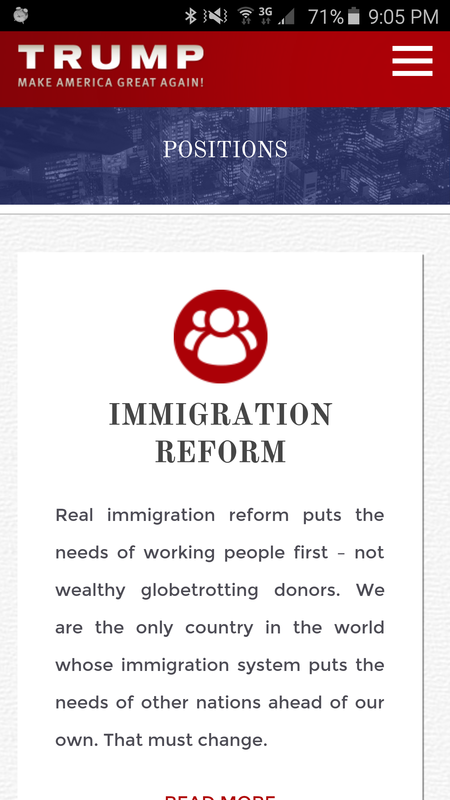 So many people are taking Trump seriously that I went to his site to review his policies. I wanted to see how he worked out policy such as how to deal with the complex relationships between the Sunni and Shia Muslim groups at odds in the Iran/Syria/Turkey/Iraq cluster. Perhaps something on the Islamic State, business with China given its recent shift in economic policy, or how to handle the volatility of the EU economy and its currency issues with Greece. Or maybe even how he will work out infrastructure issues, student debt, or corporate taxes. No. The image you see is it. His sole policy is a sparse idea with how to deal with people coming over the US/Mexico border. The damn wall is all he’s got. Trump is what cultural philosophers might call a simulacrum. He is a symbol, but he is not a representation of anything real. Trump points to nothing. He talks about loving the bible, blowing up IS and stealing their oil, and persists in his drumbeat of America’s lost greatness. But he never grounds any of what he says in reality. He has no ideas for how to fix these issues or strategies to work through the enormous complexities of the world. He does not even have bad policy ideas. In fact, he has no policy at all. If this “Great America” is something that Trump will bring us to, what is he really talking about? Nothing. As philosopher Jean Baudrillard defines simulacrum, “It is no longer a question of imitation, nor duplication, nor even parody. It is a question of substituting the signs of the real for the real.” Trump is a brand, but has no product. The only reality that Trump represents is emotion. He’s dyspeptic and ornery and he is touching the emotional nerves of people who are likewise dyspeptic and ornery. But a bad attitude is not a core competency for public office. He made his riches through calculated risk and large safety nets in wealth he had already inherited and the government bankruptcy system. His deals were just too big for banks to let fail. It was better for him to be bailed out than fail because he would be pulling a lot of capital away from his lenders. He is the spitting image of “too big to fail.” Perhaps that should be his campaign slogan. The Trump we see visibly repulsed at state fairs, eating fried chicken, and having to mix with all of the people of the world that are beneath his social magnitude is a brand without a product. He is like the hundreds of “dot com” businesses of the late 20th century that sucked up venture capital on an idea only to fail as quickly as they absorbed cash. They failed because they had no product. They had a brand and an emotion but little else. In the tech industry products like these are called “vaporware.” They are sketches with slick sales pitches that will never come to fruition. In Trump’s words they are miserable failures probably run by losers with not really a whole lot of talent. Here is the danger with Trump. He has fooled enough people into believing he has a real product that they will follow him to the edge of a cliff. If he can stick around for the next 7 months or so, he will gather people like the Blob and they will feel great tucked in by the bedtime stories of his ill-fitting baseball cap brandishing America’s lost greatness. The question is whether they will be willing to jump for him while he flies away in his helicopter having finally fooled everyone.